Given the abundance of expensive pre-rendered trailers and live-action commercials gamers are bombarded with these days, it was surprising to see people go so crazy last month over a clip that was nothing but slightly-animated concept art. Well, surprising to anyone who has never had the pleasure of playing the Homeworld series, a classic trifecta of space-based RTS games released by Relic in the early-2000s. Because nearly everything about Hardware's trailer, from the art design to the 2D animation to the narration, echoed the style used for the intros and cutscenes to Homeworld. It was enough to get people's curiosity, but not their attention. Because without more details on the game, and its universe, well, it was just a pretty little video. So overnight I had a talk with Hardware's Executive Producer, Dan Irish, to find out a little bit more about Hardware the game, and also its ambitious plans for its world, which have resulted in a slight name change. Almost immediately, I'm hit with disappointment. With a major gameplay reveal planned "shortly", Irish couldn't get into the specifics about how the game - an RTS - would play. What he did want to stress, though, was the distinction between the game's payment model and its platform. You see, Hardware is a free-to-play title. Which given the 2D art shown and baggage that model carries, had people thinking it was a Facebook (or similar) game. "It is NOT going to be deployed on facebook; that platform just doesn’t support the features that we know our fans want", Irish says. "We’ve seen a lot of disappointed comments on this point and I want to clarify that point 100%. It is not a game you play on Facebook – did I make that clear?" "The gameplay reveal is coming up shortly, so I can’t say too much about how the game actually works. 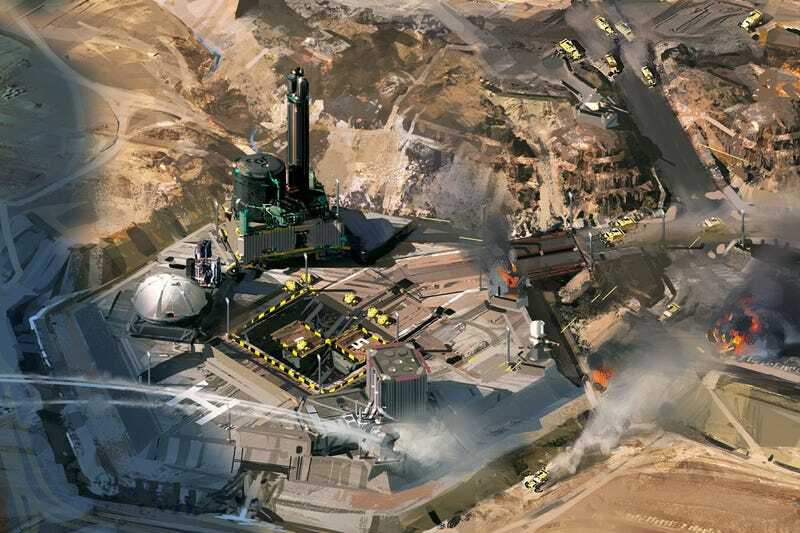 Suffice it to say it is preparing to be the next era of F2P RTS game from the creators of Homeworld." Fine, OK, no talk about gameplay. So I asked about Hardware's world, and why, in the months since we first saw the game, has its name changed from Hardware to Hardware: Shipbreakers. "'Shipbreakers' is the reference to the current fiction and setting for this RTS experience", he tells me, explaining that, having worked for two years just on the IP and fiction for Hardware's universe, the team have grander plans for the property than just a single free-to-play game. “As you can see from the teaser trailer, there are starship wrecks littering the landscape of the desert planet. How did they get there? Do you break them up to salvage or build new ones? Or do you simply claim one as your own and defend it?" "There may be other experiences, gameplay types, platforms and transmedia properties. As part of our branding strategy each will be a ‘lens’ with which you can view the Hardware universe." What I really wanted to know, though, and I'm sure the team are getting sick of the comparisons, is how much of an influence Homeworld has had on Hardware: Shipbreakers' design. After all, not only did several of the key members of the dev team work at Relic, but there are some very clear homages to Homeworld's ship design in the starships you see buried in the sand in the game's debut trailer. "Shipbreakers shares some DNA with Homeworld for sure, but any connection to that IP is purely stylistic at most", Irish says. "We’re inspired by that franchise and all that it delivered to fans over the years, but today it is a new world, new business models and new player expectations. We’re planning to deliver on a new promise of an awesome RTS experience set in a unique sci- fi backdrop of deep fiction. Just like Homeworld was ground breaking in its day, Hardware is being setup to usher in the next era of RTS revolution." While that comes across as a bit of marketing fluff, what he says next resonates as something a little more personal, and perhaps more important. "So to say that there is a connection to Homeworld—that’s true. It’s a personal connection for myself and for many others who came to be good friends, colleagues and developers of award- winning, commercially successful game franchises as a result of that one game. This is the next chapter…"
Hardware: Shipbreaks is currently slated to appear on PC and Mac, with a closed beta scheduled for Q4 2013. You can check out some awesome new art for the game here.